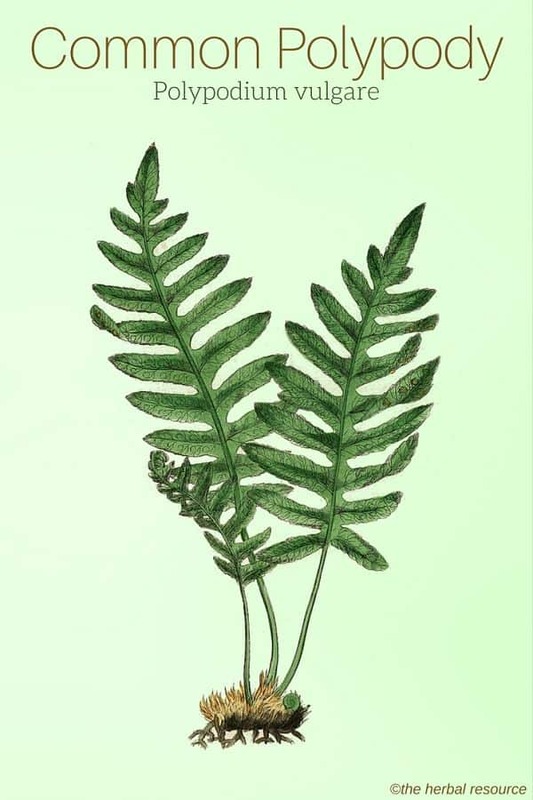 The plant’s genus name Polypodium derives from the Greek words “poly” meaning many, and “padus” meaning foot referring to the richly branched roots (rhizomes). Other Common Names: Common polydody, polypod, polypody root, adder’s fern, brake root, female fern, oak fern, rock brake, rock polypod, sweet fern, golden maidenhair fern, polipodio (Spanish), polypode commun (French), Engelsüss, Tüpfelfarn (German), kallioimarre (Finnish), almindelig engelsød (Danish), sisselrot (Norwegian), stensöta, baggesöta (Swedish), köldugras (Icelandic), kou-chi (Chinese). Habitat: Common polypody is native to Europe, North Africa, East Asia and eastern N. America. It is an introduced species in New Zealand. The fern is often found growing in cracks in stones and old man-made walls, on a forest floor and in a rocky undergrowth. It thrives best in humid, shaded or semi-shaded locations and prefers sandy soils. It does not grow well in lime. Description: Polypody is a perennial 10-30 cm tall fern with evergreen fronds (leaves or leaf-like parts of ferns) that grow from a network of spreading rhizomes. The frond produces alternate triangular leaflets that become much shorter at the end of the frond. The sori, a spherical, dot-like clusters of sporangia (produces and contains the spores in ferns and fungi), are formed on the undersides of the leaflets. The sori are first yellow or orange in color but become dark gray as they mature. The spores mature and spread in spring. Plant Parts Used: It is the rhizome (root) that is used in herbal medicine. The rhizomes are preferably collected late in the fall (October-November) and are eaten fresh or dried for later use in the form of decoction, liquid extracts, and tinctures. The rhizome has a sweet and licorice-like taste. 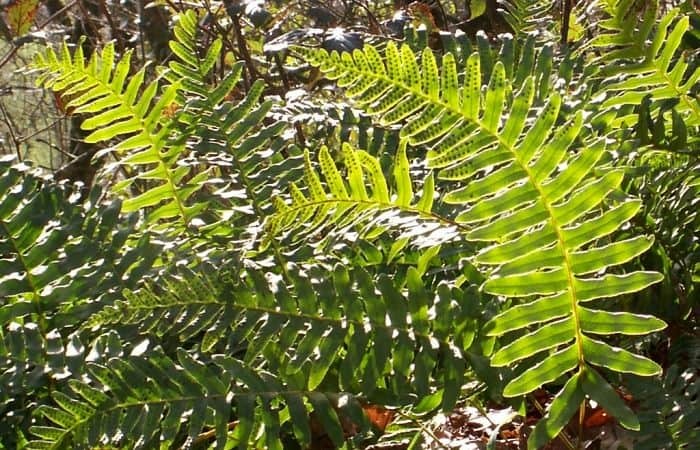 Active Ingredients and Substances: Polypody contains saponin glycosides based on polypodosaponin (osladin and polypodoside A), echysteroids (polypodine A and B, inocosterone, pterosterone and abutasterone), phloroglucinol derivatives, essential oil, fatty oil, and tannins. The sweet licorice-like taste is due to the substance osladin, which is very similar to glycyrrhizin found in licorice (Glycyrrhiza glabra). The rhizomes contain around 15% sucrose and 4% glucose. As an herbal medicine, common polypody has been used ever since ancient times. The Greek physician Hippocrates (450 BCE to 380 BCE) used the herb as a remedy for ailments associated with women’s health and Pedanius Dioscorides (40 – 90 AD), a Greek physician, pharmacologist and botanist referred to it as a laxative and also wrote that it could be used to clear mucus from the lungs. Pliny the Elder (Gaius Plinius Secundus) (AD 23 – AD 79), a Roman author and philosopher also recommended polypody as a laxative and stated that the finely powdered root could be inhaled in order to treat nasal polyps. Due to the rhizome’s sweet licorice-like flavor, it was once widely used as a kind of substitute for candy, a tradition that was very common and well known among the Saami people in Scandinavia. In the past, polypody was used as an herbal remedy for ailments such as tuberculosis, gout, scurvy, abdominal pain and indigestion. It was also used to induce sweating and urination but the herb had the strongest reputation as a a traditional remedy for coughs, the common cold and sore throat. These uses were also known by the Native Americans who chewed on the root and sucked the plant juice as a treatment. Polypody it thought to stimulate bile production and it is regarded to have expectorant, diuretic and mild laxative properties. Based on the herb’s alleged liver stimulating effect, it can be useful as a natural treatment for diseases like jaundice and hepatitis. 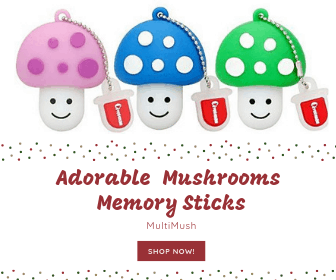 In addition, it may be helpful as a remedy for indigestion and lack of appetite. The herb is considered a safe remedy to use as a treatment for constipation in children and was also previously used to treat intestinal parasites, especially tapeworms. Polypody has also the reputation to have blood cleaning and anti-rheumatic action. Due to the herb’s expectorant properties it can be used to treat (in the form of herbal tea) respiratory ailments such as dry cough, bronchitis, catarrhs and other infections of the respiratory system. Polypody is often used in this regard in combination with marshmallow (Althaea officinalis). Externally, the crushed fresh or dried powdered rhizomes can be applied on minor cuts, scrapes, and wounds to speed up healing and reduce inflammation. Furthermore, the herb has been used as a remedy for psoriasis. The rhizomes (roots) can be eaten fresh or used as a flavoring in soups and stews. Since the substance osladin breaks down when exposed to high temperatures and prolonged cooking, it is best to add the rhizomes to the dish after cooking and allow them to soak for few minutes in the pot. The rhizomes can also be ground and used as a substitute or addition to regular flour. This use was well known in the past and often done in the times of famine. Herbal cough medicine recipe: Add one or two tablespoons of the dried root or 20cm (8 inches) of minced fresh rhizome to one deciliter (half a cup) to hot (not boiling) water. Allow to steep for 15 minutes before straining. The recipe can be divided into 3-4 daily doses. Herbal remedy for constipation: Boil 20 cm (8 inches) of the fresh rhizomes (or three tablespoons of the dried and finely chopped root) in 1.5 deciliters of water (one cup) for five minutes. Soak for 3 hours before straining. Divide the brew into few daily doses. The laxative effect is due to the saponins present in the rhizomes. Prolonged and excessive intake of polypody can cause nausea, vomiting and abdominal pain. Some people may experience minor rashes after external use of the herb. The reason for this is unknown and the rash appears to be harmless and quickly disappear. Williamson, Elisabeth M.: Potter’s Herbal Cyclopaedia. Essex, Saffron Walden 2003.